On the surface of a shallow pool of water at the bottom of Hell's Canyon, Hieroglyphic Mts., Yavapai Co., Arizona, USA. March 2011. 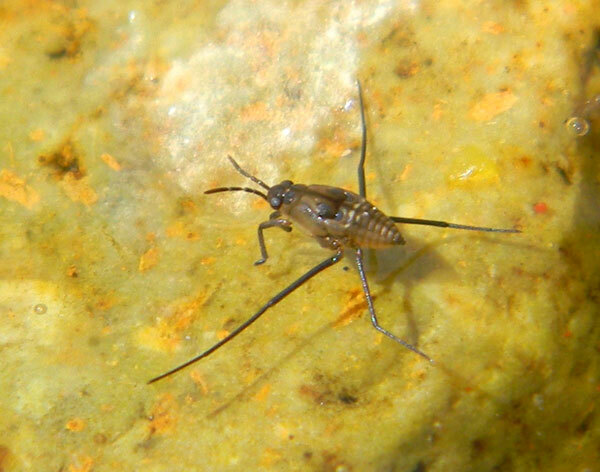 Small Water Striders are hunters feeding upon smaller insects that inhabit or fall onto the water surface. The insect shown here is a nymph, i.e. an immature bug, as evidenced by the wing buds in place of fully developed wings. Desert canyons often have small pools of water that finally evaporate. By that time the bug will have grown functional wings and will fly off in search of new aquatic habitat.